Statistics reveal that back pain will strike four out of five Americans in their lifetime. And, once a back attack hits, you are four times more likely to have a recurrence. No wonder so many people chronically wander in and out of doctors’ offices and have enough pain pills in their medicine cabinets to rival the supply of a pharmacy. If you have a back or neck pain problem, no matter how complex, we are in a position to help you. Spine Group Beverly Hills helps patients with complex back and neck problems to recover and return to activity. It includes the expertise of specialists in the nonsurgical management of back pain, affiliated spine-focused physical therapists and a fellowship-trained orthopedic spine surgeon. Spine Group Beverly Hills takes a multidisciplinary team approach to spine care, this means our health care team of professionals will pool together their expertise to develop the best treatment for each patient. The spine center in Beverly Hills includes internal diagnostics and is affiliated with spine trained physical therapists and a full exercise gym. We provide all the necessary diagnostic testing and treatment nearby to eliminate the need for multiple referrals, delayed care and confusion. 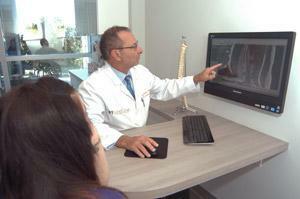 Spine Group Beverly Hills includes the expertise of Dr. John Regan, a fellowship-trained orthopedic spine surgeon. Dr. Regan is a pioneer of minimally invasive spine surgery techniques. Dr. John Regan during his medical career was one of the key physicians within Texas Back Institute, the first spine specialty clinic in the United States. Over the following years, Dr. Regan was a partner in this physician-owned spine Center of Excellence as it grew quickly from 1986 to 1995 to become the largest and most respected spine center in the world. Texas Back Institute was featured by Fortune, Forbes, NBC, ABC, CNN, USA Today, Good Housekeeping and other national magazines as a national spine center of excellence. In 2001, Cedars Sinai Institute in Southern California recruited Dr. Regan to relocate to Southern California and help the hospital create a similarly respected spine program for the Los Angeles region. For the next four years, as Director of the Cedars Sinai Institute for Spinal Disorders, Dr. Regan helped Cedars Sinai improve their spine program accordingly for the Los Angeles area. In 2005, because of the demand for his expertise as a spine surgeon by patients traveling cross country, Dr. Regan left Cedars Sinai and set up a busy spine specialty practice in the affluent city of Beverly Hills. For the past seven years he has cared for patients visiting from across the United States. Dr. Regan also has upon request of dignitaries in the Middle East, has traveled to those countries to train other spine surgeons in spine surgery. Dr. Regan's academic background includes a bachelor's degree from Brown University in Providence, Rhode Island. He received his medical degree from the State University of New York Upstate Medical Center in Syracuse, NY. He then completed an internship and residency in internal medicine at Emory University Affiliated Hospitals in Atlanta and also an orthopedic surgery residency at the University of North Carolina. Dr. Regan is one of the few surgeons in the U.S. to complete two fellowships in spine: one fellowship in spine trauma at A.O. International Hospital in Switzerland, and another at Johns Hopkins University Hospital in Baltimore. A fellowship is the highest level of medical training available. An internationally acclaimed spine specialist and a former principal at the Texas Back Institute (one of the largest back clinics in the U.S.), Dr. Regan is Medical Director at the California Spine Group in Los Angeles. He is a pioneer, developing a number of new approaches that reduce patient recovery time and improve outcomes, and offering the newest treatment in spine surgery. Dr. Regan is a pioneer and leading authority in the field of Minimally Invasive Spine Surgery (MISS), developing a number of new approaches that reduce patient recovery time and improve outcomes. So accomplished an authority is Dr. Regan that he has literally written the book on MISS techniques. "The Atlas of Endoscopic Spinal Surgery" has sold more than 20,000 copies worldwide within the medical community and has helped to form the basis of an entirely new field in spine surgery. He has recently published a second edition entitled, "The Atlas of Minimally Access Spine Surgery," a collaboration of major leaders in the field of minimally invasive spine surgery. 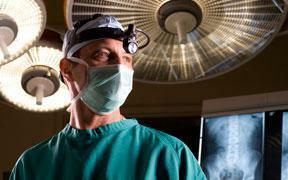 Dr. John Regan was one of the first in the world to utilize a new surgical technique called Video-Assisted Thoracic Spine Surgery (VATS), which involves the delicate maneuvering of surgical instruments through a few small incisions, aided by tiny cameras and a video monitor. Instead of large three-inch incisions, Dr. Regan pioneered the use of endoscopic instruments with cameras and cutting tips to access the spine. He is one of a handful of spine surgeons in the nation able to perform surgery on the thoracic spine (middle back) with these scopes and instruments. By operating through a tiny half-inch incision, the minimally invasive technique lessens the risk of surgery and speeds patient recovery. 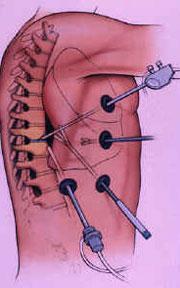 Video-assisted thoracic spine surgery is available at Dr. John Regan private practice. Various patients of Dr. Regan have shared their medical experiences. For more information, click on Patient Success Stories and view a sample of success stories. 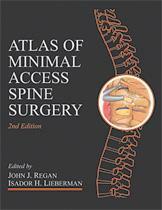 book cover with the title: "Atlas of Minimal Access Spine Surgery," with a graphic image of a spine. In addition to his book, Dr. Regan has published numerous research papers in international spine journals and authored numerous articles in peer-reviewed medical journals and textbooks. He helped found the Presbyterian Institute for Minimally Invasive Technology (PIMIT) a world-renowned teaching institute. Dr. Regan has traveled throughout the U.S., Europe, South America, and Asia teaching his surgical techniques. He is an active member of numerous professional organizations, including the Scoliosis Research Society, the American Academy of Orthopaedic Surgeons, the North American Spine Society and the Cervical Spine Research Society. Dr. Regan also serves as the medical director and consultant to medical device companies and has developed several patents related to his innovative procedures. Read more about the research papers published by Dr. Regan. Dr. Regan offers medical second opinions to patients in California, Montana, and Texas. For more information, click on Obtain a Second Opinion. Through Dr. Regan’s affiliation with non-surgical specialists he is able to provide patients with a multi-disciplinary approach that includes Physical Medicine & Rehabilitation specialists and spine-specialized therapists. Some patients can benefit from therapeutic and diagnostic spinal injections which can be conveniently provided through these associate physicians. Also, after your evaluation with Dr. Regan, he may refer you back to non-surgical spine specialists that are more conveniently located near your home for ongoing spine care. Spine Group Beverly Hills is the only spine center in California to be included in Spine Center Network, an exclusive national listing of credentialed spine centers of excellence. Click here to learn more.